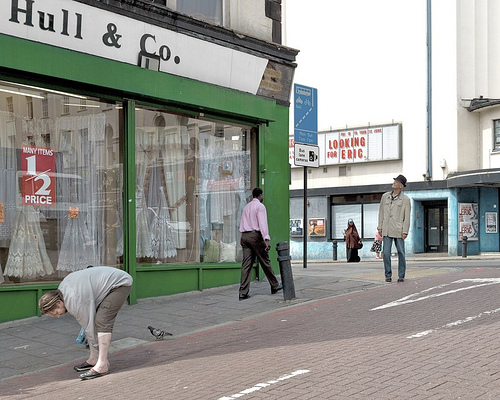 Street photography in London is experiencing a renaissance through the work of Chris Dorley-Brown. I came across an interview of him on Mull It Over. Just when I think it is the end of something I have known and loved, like street photography, up pops a fabulous portfolio of street artistry. I also love the fact that his web link is on Flickr. (I can’t get Flickr to link. You’ll have to get to his site via Mull It Over). I want to thank Jorg Colberg for pointing me toward Mull It Over via Conscientious. I was disturbed with Jorg’s elitism when he held a photo contest recently and refused any entries that were submitted via Flickr. Granted, Flickr represents the global warming of photography. It seems to just be oozing pictures out of the atmosphere at millions per minute. Flickr is also lovingly peppered with the “Frankly, Scarlet, I don’t give a damn” people. These are the iconoclasts who need to make visual statements much more than they need to relate to a photography market. I was a manic Flickr poster for a couple of years until Flickr banned me for not using their rating system. We worked it out, but I’m not much of a Flickr fancier anymore. I just like that it exists. Thanks, Rolfe. Street photography is alive and well and roaming the street corners of London. And Scranton!